Summer Clinic - This is one of the most fun times of the year. Summer Clinic is our version of camp. We have done over 15 years of clinic and it lasts 5 days a week. It is only available for two weeks in June and only to students who are enrolled in lessons at Tally Ho Farm. This is our special time with students to include riding time four days during the week and ground lessons. Every year we have a field trip day and students learn about other aspects of the horse industry. We celebrated 15 years of summer clinic this summer and it was the best clinic yet! The photos here show the students having fun while learning. Date for the 2019 Summer Clinic are June 3 - 7 and June 10 - 14. Parents' Night Out - Our winter fun started from a story Kim told her students one day in class. She told them about an experience she had as a child with a moonlit trail ride and a camp fire. It did not take long and they had talked Kim into their own evening of fun. Scheduled around Christmas every year, we call it "Parents' Night Out" so the parents can have an evening to themselves, but several parents have asked to come! We cook hot dogs and s'mores. The students ride out on the trails by moonlight and play games in the arena. It is an evening filled with fun. You can see the smiles in the photos. Look for information about signing up in the monthly newsletters in the fall. Work Student Program - At Tally Ho Farm, we want all students to have the opportunity to be involved in the barn. 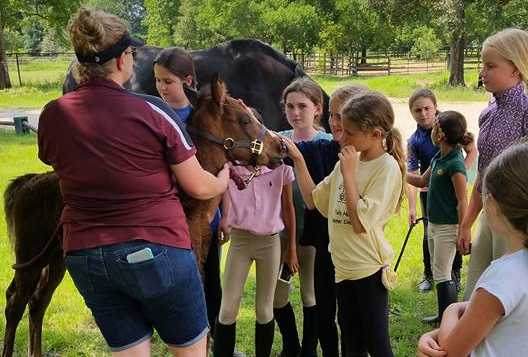 This program is set up to encourage students to help care for the horses and the facility. Students spend time at the barn cleaning, organizing and helping others while earning hours towards practice ride time on their favorite horse. Certification testing is required to be accepted into the program and annual restesting is mandatory. More information is available in the article below. Click here for Work Student Program Information. PE Program - Tally Ho Farm is an accredited off-campus facility for the Conroe, Spring, Humble and Klein School Districts' physical education programs. We offer both 5 hour and 15 hour programs. For the 5 hour program, students are required to be enrolled in two lessons per week, hold a current Work Student Certification and accumulate additional hours as necessary. For the 15 hour program, students are required to be enrolled in three lessons per week, hold a current Work Student Certification and accumulate additional hours as necessary. Hours are easily kept with all students being given a program card to clock hours. Parents are sent tri-weekly reports on their children's progression and grades are reported promptly to all schools. More information is available by talking with Kim.